K-Cars Talk about the infamous K-Cars within. Several years back my wife purchased our 1982 Chrysler LeBaron convertible, Mark Cross Edition. A true survivor, it has only 51,000 miles original paint and interior. And as far as I can tell we are the 3rd owner(s) of the car. It has the 2.6 carbureted Mitsubishi engine. Pic attached. We are slowly getting it all back in good running order and replacing the few things missing or not working properly. With any luck we can get into the survivor tent at Carlisle next summer. One of those is a sticker under the trunk lid. Now on my 67 and 73 Charger that would be the jack instructions. Do these have a sticker as well? If so and there is someone out there with an 82 convert, can I get a picture? Nice car for it's day and yours still looks GREAT! BUT as a former auto tech of that era, my condolences to you on the particular motor under the hood!...HATED that motor with a passion! 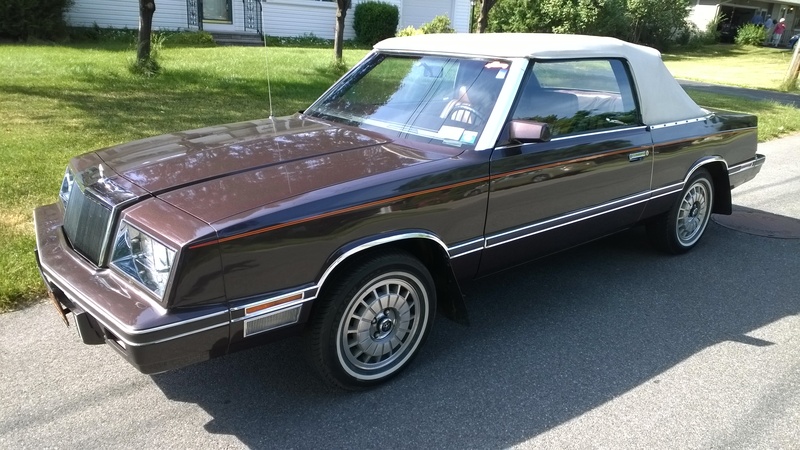 Took the LeBaron to Moparfest over the weekend. To our surprise, there were 5 others there 83-86 but we were the only 82. Not to brag but honestly ours was in the best condition. On the way up we caught a little rain and snapped one of those ridiculous white bushings on the driver wiper. Good thing we Rain-X'ed. Picked one up at the show and installed it right there. Not sure whose brain child at Chrysler that was but there has to be a better solution to that connection. They are on my 73 as well, dumb design! Glad to hear that you had such a good outing...BUT where would life's fun be without such a minor happening to occur during a "road trip"? Hey Rebel, any idea what sticker is supposed to be under the deck lid? I can see the remnants of one on ours but it is gone. Jack instructions maybe? Every one I looked at is either missing or has been repainted. LOL...I'm lucky if I can remember if I had Eggs or Oatmeal for breakfast 3 days ago! You would really ask about a sticker in the trunk of a LONG GONE vehicle from my rustbelt area??? LOGIC would have to say it was probably jacking instructions as that is where the spare and tool kit are kept. I understand you are trying to make a 100 point show car, so good luck, and post up with any big wins you get with this original! Thanks, I have never had it off, I'll look. Rear window motors ... you mean the convert top motor? LOOSEN UP!...He was JOKING with you! the generation convert. you have does NOT have rear quarter windows, hence they can NEVER fail. The next generation redesign style Has rear quarter windows that were known to go bad and parts are near nonexistent to find to repair them.